Liam was born on April 13, 2011. He was 10 days over and I had to scream and shout to be induced for 5 days as I knew some thing was wrong. Liam is my 4th and after they induced me the labour progressed, but all of a sudden his heart rate dropped to 40. I was rushed for emergency section but as soon I was out they delivered him by forceps. On delivery he was grey and limp and had an apgar score of 1. He was rushed to ICU after they resuscitated him. Liam spent 3 days in ICU. Liam was breastfed and when we came home I always felt Liam was not well. When he slept he slept too hard- his breathing always seemed labored, and although he fed well and was generally happy something was not right. He was also lethargic and often went from stiff to wobbly. Every where I voiced my concern about this I was always told "I was over anxious." I was so worried for Liam but nobody would listen. I was always told go home and enjoy your baby!!! At a few weeks old he was able to lift his head on tummy time a little but at 6 weeks he could no longer do this. I was getting increasingly worried for my son and spent many nights lying awake listening to his breathing. At one month old he went to the local health centre to have his BCG done only to be told they felt he was lethargic and floppy and he was sent straight to ER. They ran some bloods and said nothing showed up but decided to keep him in overnight to do a brain scan in the morning as his fontanel felt swollen. He was being admitted upstairs when a registrar came and looked at him and said there was nothing wrong with him and sent him home with no brain scan. If they had done the scan they would have seen that Liam has a lot of fluid on his brain and his spaces are much wider. Then time went by with me still concerned and on July 19, he had what I felt was a seizure. It would have been easy to miss as it was minor with his arm and leg flinching. I rang the doctor and while I was on the phone I got upset as I knew something was really wrong with Liam. They told me go to ER but as the phone call went on they decided he should go to the doctor’s office as it was closer. I went in and they said it was a seizure- he also had a little froth in his mouth. An ambulance was called and Liam was taken to ER where he then spent 2 weeks with doctors scratching their heads. We demanded to go private for the best care possible and we then received the best doctor there. Liam’s oxygen kept dropping to which the nurses kept saying it was only due to the machine because he was crying, active, and sleeping. I became so angry since due to their poor treatment of us during his labour I had very little faith in them. Eventually I lost my head with 3 doctors and I actually went dizzy from screaming so much. I told them there is something wrong with my son and they must find out what it is. The doctor had said the monitor was to stay on at all times and if his oxygen went below 95 he had to have a mask. The nurses used to come in and turn off the machine every time it alarmed and I used turn it back on and give him the oxygen myself when it dropped. One of the nurses decided to prove to me that it was the machine when his oxygen was at 52 but when she put the mask on it came straight back up. She then was on our side and called the consultant in to see us. I was furious that this happened as they only proved that they had been starving my baby of oxygen. At some points in hospital they were calling him morbid looking. They were also medicating for seizures and almost over medicated him with a very strong anti seizure med which was supposed to be every 24 hours but they tried giving it again 2 hours later, except I wouldn’t let them- he was already practically unconscious. Eventually Liam got a bed in the specialist hospital and 2 days later they told me he had epilepsy. Liam had an MRI done. I was told there was no damage but he had fluid on the brain and wider spaces. Two days after being told he had epilepsy the door opened to 3 doctors and 2 nurses and I knew we were in trouble. When they sat down I said to the Neurologist “its bad isn’t it” he replied “it is its bad alright” and went on to say Liam had Glutaric Aciduria Type 1. For a second I was relieved because they were not telling me he was going to die so anything after that was a bonus. Liam was moved to the metabolic unit where we spent 10 days learning about his disease. They said he was caught on time and the professor came to tell me I had almost saved Liam as I was very astute and all of his symptoms could have easily been missed. We went home and tried to get used to our different way of life, all the while so worried for our son as we felt he had a lot of delays and were concerned about that. Time went by and a lot of fights with a lot of people for physiotherapy, etc. Liam gets physio now once a month and does pretty well overall but he is now 10 months and still has poor head control. Some days are worse than others. He also has dystonia and he is poor physically. In October we were told by the Neurologist that Liam will probably never walk or talk. We got so upset since it was the first time it really hit me. I think most of the time I am running on auto pilot as I am afraid to stop and think. He can’t roll over or sit up and doesn’t have great control of his hands but he is such a happy baby. Just last week Liam had another seizure which he hasn’t had since diagnosis. During the phone call to the Metabolic unit I was told that I knew he had brain damage and dystonia and that’s how he was diagnosed but I was never told such things. I was always told he was good and that he had no brain damage. We are going up there tomorrow for the week to have meetings with Neurology and the metabolic team and to learn how to tube feed Liam. So hopefully I will have some more answers. We have 3 other sons Shane (13), Conor (8), and Ryan (2). All of our lives have been affected by this as there are no more birthday parties or days out in public. It’s a small price to pay for our son’s safety. We love our baby so much and will always fight his corner. At times it is really difficult. GA1 is now our everyday life and there will always be unanswered questions. This I find very difficult. I also find it difficult to watch Liam get frustrated at the fact he can’t move around or get a toy. These are all things I have to accept. 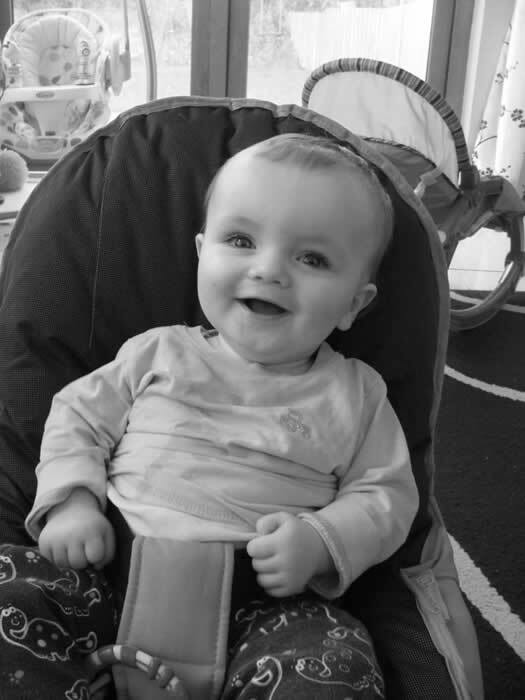 I can’t bear to think of my beautiful boy in pain, not even for a second, and I wish I could help him but there is only so much I can do for Liam. The rest is up to Faith of which I definitely believe in now. Liam’s life to date, although born on the 13th, has been down to Luck and I would say a higher source of power as on many occasions Liam could have been lost. My boy has been fighting since before he was born and is my Hero.